I can't really sleep right now, probably because I'm anticipating my first art exhibition later today. I was lucky enough to be invited by Clogtwo to be part of his show. I've never truly showcased any of my work apart from online media and the school graduation show, so this is quite a big deal! Preparation for the show was a hectic process, but I think I learnt a lot. In a strange way, collating my work and printing them out was sort of a cathartic procedure. Looking back at some of the things I did in the past made me realize a few things about my process, my growth and even gave me clues as to where I would want to go next. 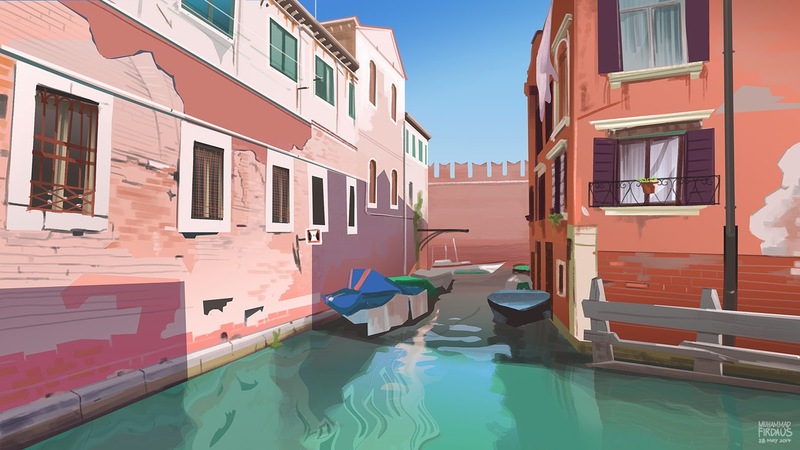 In any case, I've been looking at all the wonderful art in this awesome Virtual Plein Air group and decided that I needed to get into environments once more. This was definitely a good exercise. You can find the location here on Google Maps.